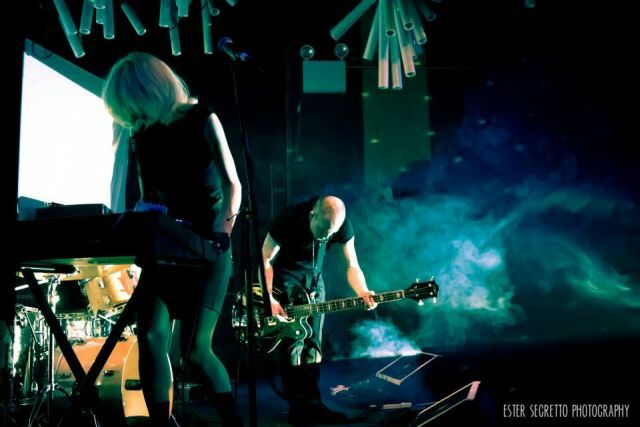 The NYC-based dark-gaze duo of Peter and Gina reveal details about their recent storming melodic-noise album. Gina: If I stay inside I will for sure eat too much, so I make myself go out and tell myself that I like the cold. Also, our dog LouLou Reed chewed up our rug…so there’s that…. Peter: This has been an endless winter -- thanks Mr. groundhog. We were on a self-imposed performance hiatus for most of the winter, focusing on writing and preparing to make a video. Speaking of imagery, what is the meaning behind your band’s name? It’s a head-scratcher for me – Does it refer to the novel by Clifford Chase, or the Scottish nursery rhyme “Wee Willie Winkie”, or the John Ford-directed film, or…something completely different? Gina: Our name has been getting us in a lot of trouble lately. I had no idea it had a deviant meaning, I swear! We took the name from a David Lynch movie because we thought it sounded fun - and we really like the movie. Peter: Yes, we choose the name while working on music for a few short films by our friend Paul Natale ("The Lesson" and "Cassie"). We didn't know what to call our "project". After watching David Lynch's “Mulholland Drive” a few hundred times, we picked Winkie (after the name of the diner). As in, "I had a dream about this place..."
You stir up a churning and immersive cyclic wall-of-sound on your songs that, at least to me, recall the textures of the band Curve, except that you accomplish this with nary a guitar in sight! Do you both have a perverse phobia of guitars or are you just drawn to the keyboards more? Peter: Those sounds came straight out of the talents of Gina. When she started developing it (while recording "My Eyes Are Closed When The Sun Comes Up"), I knew instantly where she was going and I loved it! Gina: We did not set out to make a record with no guitars. Peter is actually an amazing guitarist. It just ended up like that. Sometimes you just have to go with it. I didn't think that what I was doing sounded like guitars to be honest, until it was pointed out to me a few hundred times. Then again, I also thought I was writing very melodic songs. Ha! As far as any sort of aversion to guitars – no - definitely not. What’s so cool is that you don’t even miss the guitar sound. What type of keyboards/synths do you use and do you generate your dense and intense sonics all on this instrument? Gina: I'm not trying to be all secretive, but I just use whatever keyboard/synth is closest to me when I want to record- to me it’s not necessarily the keyboard but the accessories that I can add to the keyboard to re-create the sound that’s in my head- I did use a few different KORGS, and at one point a NORD, though, if that answers your question a bit more directly. There were quite a few- we’ve recorded bits and pieces of this album all over the place and some of the instruments we no longer own. I like accessories- like diamonds and emeralds…. I would be remiss if I didn’t point out that you play bass, Peter. So maybe you’re not 100% guitarless…? Does your bass-playing feature on all of Winkie’s songs? Gina: Peter- this is all you. Peter: That is true - I do play bass guitar on all the songs. But, the tone most people interpret as guitar is actually Gina on keyboards. Your mesmerizing debut album “One Day We Pretended To Be Ghosts” is out now and was mastered by Oliver Ackermann of APlace To Bury Strangers. What was it like working with Oliver and how can we get a hold of your limited-run album? Gina: If you want me to completely nerd out ask me about Oliver Ackermann. I still can't believe he likes our work. It's very surreal for me because I am such a huge APTBS fan and have been for such a long time. He rules. As for the album- you can get it directly from us! Peter: We were beyond excited when he said he would work on the album. It was a huge honor for us. He is incredibly busy. He worked on it during his most recent tour. He is one of the nicest people to work with. He knew exactly what we were thinking. You previously released a 7” for the awesomely, and possibly vampirically, titled song “My Eyes Are Closed When The Sun Comes Up”. Did a specific film or book or band (like maybe early-era The Cure) inspire this song and its title? Gina: I like that suggestion. I've heard so many interpretations of what that song means to people and it's wonderful to know that you are listening and thinking about it. Someone told me that they always listen to it before they head out for the night. It makes me very happy to know that someone out there is excitedly applying heavy black eyeliner, anxiously anticipating the night ahead while listening to us. From my perspective, you channel the noisier side of the industrial, goth, and darkwave genres (i.e., the wasp-like buzzing, grimy grinding, siren calling-type noise) into something that enjoyably balances on the precipice with distorted and looping propulsion. Do you find that you’re attracted to raw and harsh sounds and want to smooth them out a bit on your songs? Gina: I’m glad you find it enjoyable. Thank you for the compliment! I have learned through my own trial and error that I tend to add so many layers that it becomes difficult to hear what’s going on. Peter does a great job at telling me when to scale back, take stuff out, etc… To me though- it’s never enough, which is problematic. So I would say that Peter is the one who balances everything out. I’m not good at balancing. Peter: We are definitely attracted to that Stooges "Raw Power" blistering distortion. It just sounds right. Overall, we're an "all levels in the red" type of band. Usually, I will smooth it out when we are mixing... just a little. Gina, on some songs your vocals are light and sweet, but most other times they’re darker and distorted. How do you achieve that effect in studio? Gina: The vocals seem to reflect how I was feeling at the precise moment they were record. So if my vocals sound angry - I probably was. I had intended for my voice to not be the focus of any of the songs, but more of a texture - that is not how it turned out though. Usually what happens is that Peter will listen a few times and take out a few of the thousand effects I've put on my vocals. We will also ask our musician friends to listen from time to time for an outside perspective. You’ve played a lot of gigs in the Brooklyn area. Have you ventured outside of that zone yet? What is the live Winkie sound like compared to record? Gina: We hope to venture out of our comfort zone this year actually. As far as the live show - I get really nervous before shows, so I have to practice beforehand and kind of have an idea of how it’s going to go down. You never really know what’s going to happen once it starts though - which I guess is the exciting part. We try to keep the live sound close to the record. We do like to make our live set visually interesting and frequently change that up. We also love to buy new things like clothes and gear, so this gives us a great excuse to go shopping. Peter: We would love to! We did have one performance in Salem, but we are hoping to make it out to the West Coast (Los Angeles, San Francisco, Portland, Seattle) this May or June. Then, perform around the East Coast (Philadelphia). Bigger plans would include England. The album has had a lot of support over there. I think our music has a cinematic quality. Live, we attempt to take the audience into that “world” with backing videos, smoke, and lighting. You both go to other bands’ gigs in the NYC area. What are some cool shows that you’ve attended lately? Gina: Peter goes to more local shows than I do, but I saw Stargazer Lilies a few weeks ago at Mercury Lounge in NYC and they were great! A really fantastic band that I saw back in December was Factory Floor. They are coming back to NY soon and I cannot wait! I think there is a Swans show in our future because I saw the tickets in our apartment somewhere. 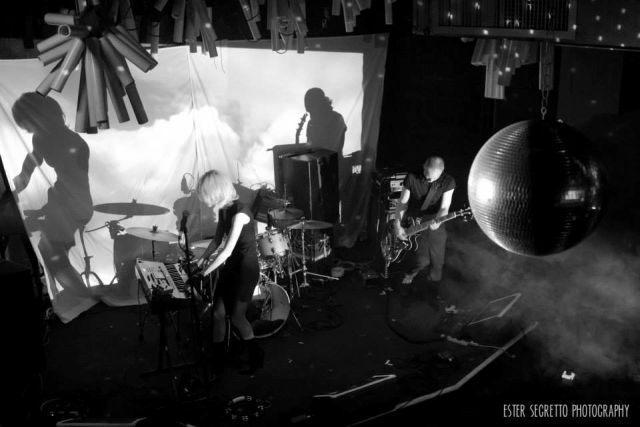 Peter: Some recent shows - Norman Westberg (Swans) at Union Pool, Jon Spencer Blues Explosion at Brooklyn Night Bazaar, Dead Leaf Echo at Union Pool, and The New Lines at Mercury Lounge. I'm really looking forward to the performance based around Jim Jarmusch's "Only Lovers Left Alive" happening in April at Santos Party House – and Swans. Gina, I read in another interview that you’re mad for Skittles and Starburst. Are you a candy junkie? Are those still your faves? If you need a sugar fix in cookie form, you should try Black ‘n’ White cookies with the thick glaze of pure sugar icing on top. That’s my fave ‘sweets’ for the moment. Gina: Ah yes, black and white cookies. I used to eat them all the time - especially after late night parties - I was such a rebellious kid - staying out all night long eating black and white cookies. I’m going to make this story cooler by saying I chased the cookies with vodka… but nobody is going to believe that… I probably chased them with soda and pixie sticks.